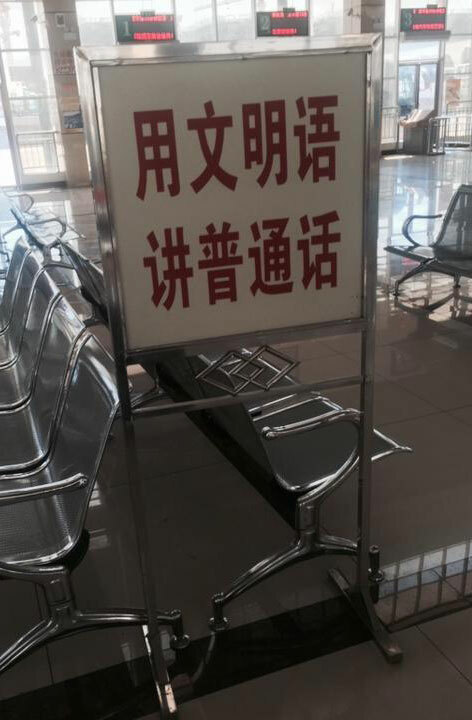 If you look that up on the internet, you will find that most of the references fall under the categories of biāoyǔ 标语 ("slogans") and xuānchuán 宣传 ("propaganda") — of which there are aplenty. Such slogans and propaganda are much in evidence throughout the country (note especially the propaganda boards that you see all over the place in China). The injunction to speak MSM often appears in parallel with the charge to xiě guīfànzì 写规范字 ("write standard characters"). It is not difficult to tease out the implications. The intent is to displace Mongolian culture with a Chinese one. It's been done in Tibet too, with implication that if you don't speak Mandarin you're a country bumpkin. No doubt similar signs have appeared throughout the world, like this one from southern France (from the early 20th century I think). @Mark Meckes — or the "Speak English" movement that popped up at various times in the US, including… Colorado? The stigmatization of Black English/AAVE/Ebonics as "bad English" is a closer analogy, as is the stigmatization of Southern US accents more generally. …whereas you don't hear much of the effort to eradicate indigenous American languages today since it succeeded so nearly completely. As the tour guide said to us on a visit to New Orleans recently: "It's good thing Andrew Jackson won the Battle of New Orleans in 1815 – otherwise we'd all be speaking English…"
@Matt McIrvin I would say that the US today is much more liberal about multilingualism, rather than that the absence of signs is because indigenous languages have already been eradicated. Spanish – specifically Mexican Spanish – is, for example, becoming a second language in large swaths of the US, and multilingualism is encouraged, not discouraged, in a great many US schools. It wasn't always this way, and indeed there are still segments of American society who fear the spread of multilingualism, but it is a long ways from the time when the federal/state governments had to put up posters about the need to speak English. As for the PRC, they are in that stage of nation-building in which multilingualism is still seen as being subversive to the goal of political unity. But have yet to understand, I think, that hard-nosed propaganda posters of the sort shown above are liable to offend and threaten, rather than to sway. @Eidolon "Hard-nosed propaganda posters of the sort shown above are liable to offend and threaten, rather than to sway." You might be surprised at the size of the general public who actually agrees with these propaganda posters. I have often come across people who believe that their mother tongues are vulgar and uncultured, and take pride primarily in the fact that they contain colorful swearwords. The fact that school education only acknowledges one standard pronunciation when reading literary texts, even in historical cultural centers such as Suzhou, Fuzhou and Guangzhou, further reinforces the stereotype that Standard Mandarin is the sole vehicle of high culture. Sadly, forceful eradication of topolects has been very effective in most areas across China. You guys read too much into this sign. Without standardization of pronunciation, China would have a higher chance of separation into multiple small countries, not to mention the great inconvenience to everyone living in the country. The negative side is, understandably, less fun to the people that enjoy reading language blogs. It's certainly understandable that the government wants to prevent the country from splitting into small countries and is trying to use language as a tool to achieve that, but if China was actually multiple countries (à la Europe) that would not necessarily be a bad thing. Also there are quite a few countries which are nowhere near falling apart despite not having a common language for all citizens: Switzerland and India come to mind. Or those many African countries where the main lingua franca – English or French – hardly lends itself to national identification. Yeah I'm not going to say "we must have nationalistic movements so we don't form into smaller communities" because wow, there's so much political drama going on in that it'd take a long blog post to unpack it. Suffice it to say that there's no reason to buy into Speak Putonghua without also buying into an ethnic nationalism that prizes Han Chinese speaking one restrictive form of modern Guanhua at the price of everything else. @JQ I think China is very different from Europe in the sense that its flat-plains geography has never allowed for easily defensible borders for regional states. Even during the Warring States period, when China actually had fairly powerful regional kingdoms, borders were constantly shifting as they were being destroyed/swallowed by other kingdoms, till, as every Chinese school child is taught, the First Emperor "united" all under heaven. The control of water sources being so critically important, even today, it's difficult to see how division in China is not going to result in a few geographically well-positioned states along the great rivers bullying the rest.